1. What are the needs for digital skills in EU workplaces? Cedefop’s analysis reveals that the future structural transformation of EU labour markets is tightly knit with a high demand for advanced digital skills. Indeed, a previous #ESJsurvey Insight (No 8) has shown that there is a strong positive correlation between jobs that are anticipated to grow in employment in the next decade, as extracted from Cedefop’s skill forecasts, and the importance of advanced digital skills within such jobs, as derived on the basis of the ESJ survey (Cedefop, 2016). This finding is in agreement with a wealth of other sources, including information from Eurostat’s surveys on ICT use by enterprises and households. A recent investigation by the European Commission (2016) of the job profiles of 12 occupations which have been traditionally penetrated less by ICT investments (e.g. dairy farmer, machine operator, industrial designer, VET teacher etc.) has also highlighted that the use of ICT profoundly affects the work task and skill requirements of such jobs. Nevertheless, despite widespread acknowledgement of the importance of digital skills, there has been little information about the type of ICT skills required in EU workplaces and the extent to which employees are coping with such demands as part of their workplace tasks. Cedefop’s ESJ survey partly fills this gap as it collected information on the highest level of ICT skills required by EU employees so that they can carry out their job tasks (Cedefop, 2015a). The survey distinguished between three broad ICT levels needed so that workers can do their job, namely basic ICT level (e.g. using a PC, tablet or mobile device for emailing or internet browsing), moderate ICT (e.g. using word-processing or creating documents and/or spreadsheets) and advanced ICT skills (e.g. developing software, applications or programming; using computer syntax or statistical analysis packages). 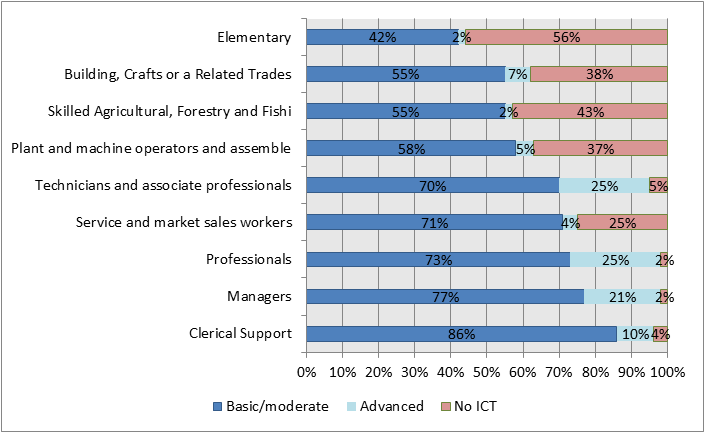 The survey also allowed respondents to state that their job does not need any ICT skills at all (Figure 1). 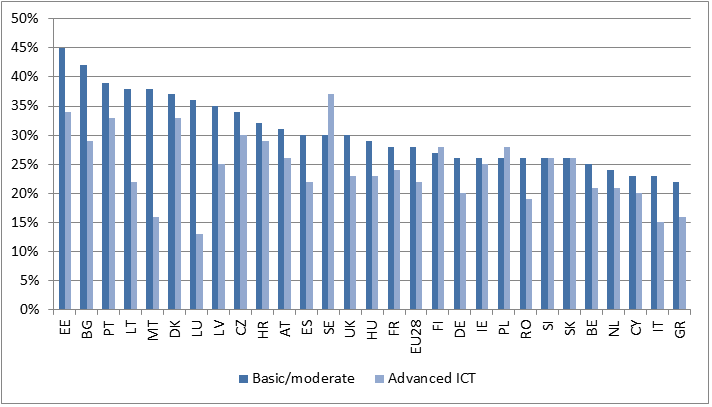 The majority (52%) of adult EU employees stated that a moderate ICT level is required to carry out their job tasks and another 19% require a basic level. Together, more than seven in 10 (71%) EU employees need some fundamental level (i.e. basic or moderate) of digital skills to perform their jobs. 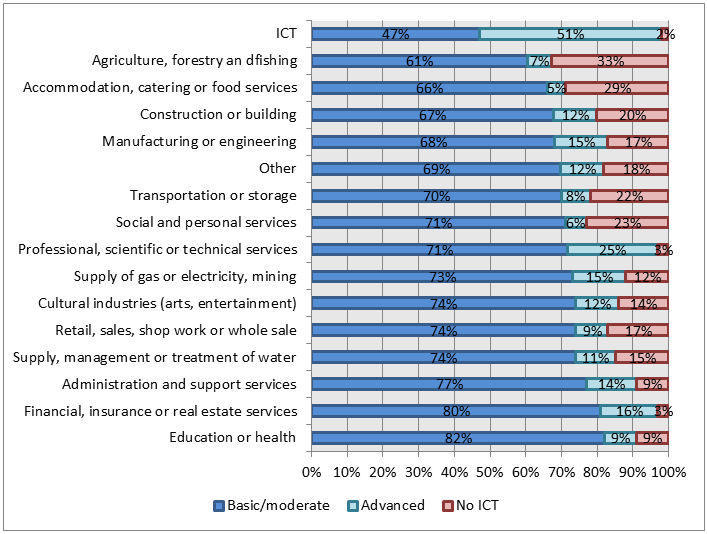 About 14% need an advanced ICT level, in contrast to 14% who stated that they need no ICT skills at all in their jobs. Sweden, Denmark and Ireland are the EU countries in which more than 80% of their adult workforces need at least a fundamental level of ICT skills to do their jobs, in contrast to Cyprus, Romania and Greece where the same holds for about six in 10 workers. Portugal, Bulgaria, Latvia and the Netherlands have the highest share of employees (over a fifth) reporting that their jobs do not need any ICT skills at all. NB: Share of valid responses to the question: Which of the following best describes the highest level of information communication technology (ICT) skills required for doing your job? Source: Cedefop European skills and jobs survey. Analysis of the ESJ survey microdata reveal that the digital divide, namely the exclusion of some population groups from the advancements of the digital era (World Bank, 2015), is a quite prominent feature of the European job market. Figure 2 shows that a remarkably high share of specific sub-groups of the EU workforce does not need any ICT skills at all to do their jobs, ranging from as much as 56% among those undertaking elementary occupations to 25% of service and market sales workers. As much as 33% of employees in the agricultural sector and 29% in the accommodation, catering and food services sector stated that they are in no need of ICT skills to perform their jobs. For these workers manual or other skills play a more important role (Figure 3). Individuals spend the greatest portion of their daily lives at the workplace. So, if individuals are employed in jobs that do not require or utilise digital technologies they may be less inclined to use digital technologies outside of work as well, or fail to develop the digital proficiency needed so as to be an active participant in society. This could underlie the high proportion of the EU population that has low digital skills or do not use the internet (European Commission digital scoreboard, 2016). To mitigate the exclusion of specific groups from the use of ICT, many countries have taken or are preparing measures that can maximise access to ICT training and active learning (Cedefop, 2015b). Several countries have put digital agendas in place that take the needs of at-risk-groups into account and promote digital inclusion for all. It is therefore expected that the supply of basic digital skills in EU economies will progress steadfast. Nevertheless, in the future world of work it is likely that advanced digital skills, in particular programming and coding, will become a key prerequisite for entry into many jobs and command a wage premium (Berger and Frey, 2016). Even in today’s EU job market the ESJ survey reveals that, after taking into account various important factors that determine employees’ earnings (e.g. gender, age, education attainment level, years of job tenure, aptitude to learning, occupation, industry), workers employed in jobs that depend on advanced ICT usage enjoy an (statistically significant) hourly earnings premium of about 3.7%, relative to workers employed in jobs that need a fundamental ICT skill level. This premium falls to 2.5% if one also allows for the effect on earnings of a set of complementary skills, cognitive (literacy, numeracy, foreign languages, problem-solving, learning to learn) or non-cognitive (team-working, planning, communication, customer service). By contrast, individuals employed in jobs that do not require any ICT skills at all receive about 8% lower hourly average wages, compared to other equivalent employees who work in jobs dependent on fundamental ICT skill usage. The wage premium placed on advanced ICT skills rises to as much as 7-8% in the UK and Germany, while employees in jobs that do not need any ICT skills receive about 20% lower hourly wages in the Czech Republic. NB: Marginal probabilities at the mean based on estimation of a probit multivariate regression model. Base categories include: age: 24-39; education: medium qualification; past labour market status: employed in another job; job contract: indefinite; workplace size: 1-9. Despite the anticipated growing importance of advanced digital skills in EU labour markets, the ESJ survey data reveal (Figure 4) that at present some groups of the EU’s employee population are at disadvantage. Specifically, older, low-educated and female workers have a lower likelihood of needing advanced ICT skills as part of their work. Having returned back to the labour market after experiencing a spell of unemployment also reduces the chances of entering into a job reliant on advanced ICT skills. The same holds for individuals who are employed in the public sector, in part-time or informal jobs (i.e. where no formal contract has been signed) as well as in micro- or small-sized workplaces (i.e. those with less than 50 workers). 3. Digital skill gaps: are skills or technology winning the race? In addition to the exclusion of a sizeable part of the workforce from the digital economy, the ESJ survey also collected information on the (digital) skill mismatches of adult EU employees. The survey requested from the respondents to assess the extent to which their own level of skills exceed or lag behind those needed to do their jobs. Focusing on ICT skills, in particular, the survey asked respondents to provide an assessment of their mismatch, conditional on the level of ICT use (i.e. basic, moderate, advanced) in their work as was previously identified. The country rankings of digital skill gaps reflect both the level of digital proficiency of the adult workforce of each country and the degree of ICT skill requirements in their labour markets. In other words, the proportion of workers with digital skill gaps will vary between countries depending on the share of high-skilled workers in their economies and/or the variance in the level of digital skill intensity across jobs. What this implies is that the low fundamental digital skill gaps of some countries (e.g. Romania, Cyprus, Greece, and Netherlands) may be attributed to a lower average level of skill intensity within jobs that need fundamental ICT skills, regardless of the digital skill proficiency of their workforces. By contrast, countries at the higher end of the spectrum, such as Bulgaria, Portugal and Estonia, may have a higher share of workers with fundamental digital skill gaps either because such jobs are more digitally skill-intensive or because the workforce has low digital skills. In fact, examination of the ESJ survey data reveals that there is noticeable variation in terms of the importance of digital skills, as well as other cognitive and soft skills, in the subsample of individuals who stated that their jobs need a fundamental digital skill level. For example, some countries (e.g. Austria, Belgium, Finland) have a higher mean level of importance of digital skills that exceeds a score of eight (on a 0-10 scale, where 10 implies that ICT skills are essential for doing the job), in contrast to others that have an average score that is closer to seven (Czech Republic, Bulgaria, Spain, Croatia). Annex Figure A1 thus depicts the share of employees with digital skill gaps after purging out the effect of the skill intensity of their jobs (both in terms of the importance of digital skills and the importance of a set of another 10 skills) from their raw reported skill mismatch. The figure highlights that the share of employees who suffer from a fundamental digital skill gap, which cannot however be attributed to differential skill intensities of their jobs, is approximately 17%. It ranges from a high of 31% in Estonia, 29% in Malta, 26% in Lithuania and 25% in Denmark to a low of 12% in Greece and Netherlands. 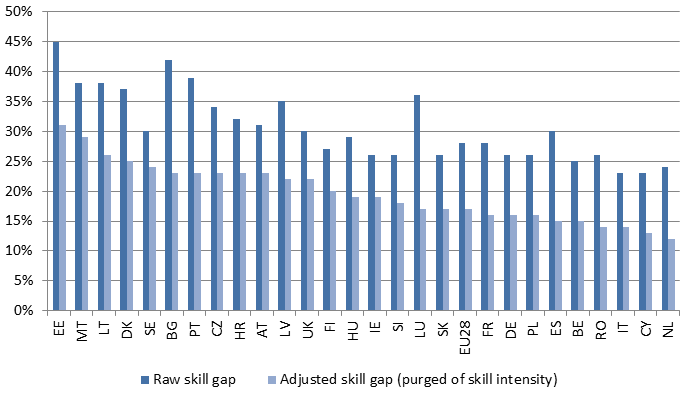 For some countries, notably Bulgaria, Luxembourg, Portugal, Spain and Estonia, a significant portion (over a half) of the raw fundamental digital skill gap can be attributed to the skill intensity of jobs, while for others (e.g. Sweden, Ireland, Finland) the majority of the digital skill gap can be explained by factors unrelated to skill needs (e.g. human capital characteristics of workers, other job features etc.). 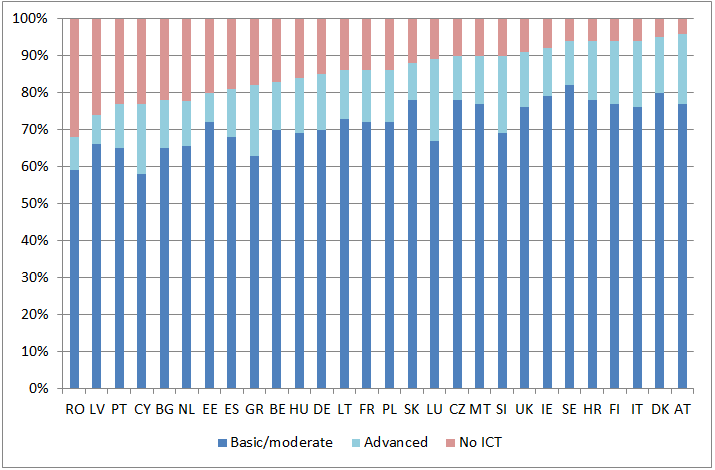 Figure 5 depicts the share of employees in the EU28 Member States reporting a digital skill gap, dependent on whether their job needs either a fundamental (basic/moderate) ICT level or advanced ICT usage. On average, around 28% of the European workforce ranks their own level of fundamental digital skills quite low in relation to what is required. Some 22% of those employed in jobs needing advanced digital skills are at risk of skill gaps. Around 40% of employees in Estonia, Bulgaria and Portugal are affected by fundamental digital skill gaps, as opposed to one in five in the Southern European countries (Cyprus, Italy, Greece). Workers in Sweden, Estonia, Portugal and Denmark are also the most susceptible to skill gaps in advanced ICT skills. NB: Share of responses with scores below 6 to the question: ‘How would you best describe your skills in relation to what is required to do your job? Please use a scale of 0 to 10 where 0 means your level of skill is a lot lower than required, 5 means your level of skill is matched to what is required and 10 means your level of skill is a lot higher than required.’ Responses are conditional on level of ICT use needed in the job as identified in a prior question of the survey. Over a third of individuals employed in the agricultural sector, accommodation, catering and food services, and social and personal services, are affected by fundamental digital skill gaps. By contrast, less than a quarter of workers have fundamental digital skill gaps in the ICT and financial, insurance and real estate services sectors. Figure 6 also highlights that over a third of building, crafts and related trades workers, skilled agricultural employees and individuals employed in elementary occupations are prone to fundamental digital skill gaps, as opposed to about a quarter of managers, clerical support workers and technicians. Among those whose job performance is dependent on advanced ICT usage, workers in elementary occupations, assemblers and in sales jobs are mostly affected by inadequate levels of digital proficiency. In addition to differences in the incidence of digital skill gaps between different sectors of economic activity and occupations, the ESJ survey also allows for further breakdown and investigation of the relationship between digital skill gaps and various demographic and socioeconomic characteristics of adult European workers. In this respect, Figure 7 displays the estimated probability of a worker reporting a lower level of digital skills relative to their job requirement according to a particular set of characteristics. NB: Share of responses with scores below 6 to the question: ‘How would you best describe your skills in relation to what is required to do your job? Please use a scale of 0 to 10 where 0 means your level of skill is a lot lower than required, 5 means your level of skill is matched to what is required and 10 means your level of skill is a lot higher than required.’ Responses are conditional on the level of ICT use needed in the job as identified in a prior question of the survey. It is evident from the graph that characteristics that prohibit employees from being employed in an advanced digital job (as shown in Figure 4) and which sustain the digital divide (e.g. firm size, gender, education level etc.) are also associated with a higher risk of workers stating that they suffer from digital skill gaps. In particular, females, older-aged and lower-educated workers, as well as those employed as professionals in presumably high skill-intensive jobs, have a higher likelihood of digital skill gaps. By contrast, employees in lower-skilled occupations have a lower likelihood of experiencing a digital skill gap, relative to those in managerial posts. The risk of a digital skill gap is found to be positively associated with the receipt of formal continuing training in the job, which highlights that, on average, employers and individuals respond to digital skill gaps via remedial vocational training courses. Fundamental digital skill gaps are also found to be more frequently reported in micro-sized than in larger-sized workplaces, though the size of the workplace does not have a significant effect after taking into account other firm characteristics. NB: Marginal probabilities at the mean based on estimation of a probit multivariate regression model. Base categories include: age: 24-39; education: medium qualification; occupation: managers. 4. Which skills are complementary to digital skills? As highlighted by the OECD (2016), the transformation spurred by the introduction of digital technologies in workplaces does not only affect the demand for digital skills but also places a premium on other ICT-complementary skills. For example, the use of ICT at work affects an individual’s overall ability to carry out work-related tasks. Typically, the higher frequency and availability of information associated with digital workplaces requires strong foundation skills (e.g. literacy) and a higher degree of planning, personal adaptability and ability to screen and filter out essential evidence. Similarly, so-called skilled-biased organisation change has involved the proliferation of horizontal hierarchical structures in firms and those, in turn, call for a greater need for team-working, cooperation and leadership skills. In such digital settings, interpersonal and customer interaction skills are also affected – for example, the increasing importance of ecommerce is less dependent on face-to-face interaction, which is typical of non-digital commercial transactions. In addition to enquiring about the ICT level needed in adult workers’ jobs, the ESJ survey also asked respondents to indicate the importance of a set of ten other cognitive, non-cognitive and job-specific skills. 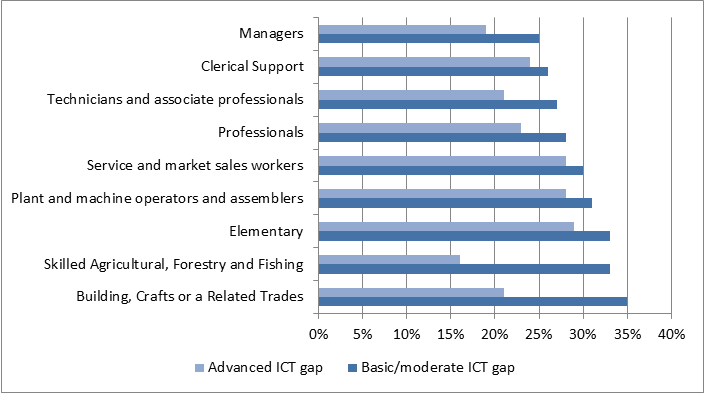 On the basis of this information, Figure 8 depicts the (estimated) odds that the job of an ICT user will also be dependent on non-ICT skills. The estimated probabilities are calculated by comparing the samples of employees who stated that their job requires a fundamental or advanced ICT level with those who do not need ICT skills to perform their tasks. In addition, it has been ensured that the estimated odds ratios are not influenced by the differential sectoral or occupational distribution between ICT and non-ICT skill users, while other key demographic and socioeconomic differences between the two groups (e.g. gender, age, education level) have also been taken into account. 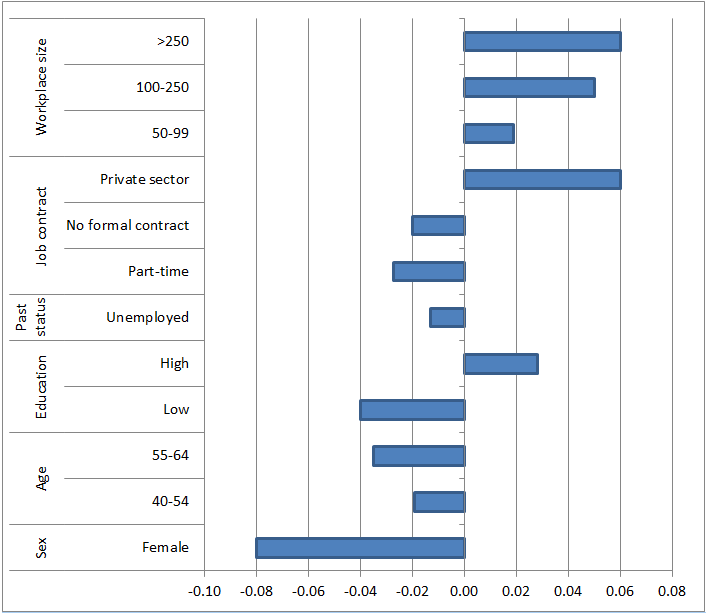 In other words, the reported odds ratios in Figure 8 are partial correlations that cannot be attributed to various external influences, such as the fact that ICT users are more likely to be males, high-educated or ICT industry employees, characteristics which are simultaneously correlated with jobs that also need higher levels of non-ICT skills. NB: Estimated probability (difference of the estimated odds ratios from the value of one) based on a logistics multivariate regression model. The dependent variable is the highest level of ICT skills needed for doing one’s jobs and is regressed on a set of variables capturing the importance of non-ICT skills. The empirical specification accounts for gender, age, education level, occupation, economic sector and country dummies. Interpretation of graph: The job of an average worker that relies on foundation ICT skills has an 18% higher chance that numerical skills are also important, relative to that of a comparable worker that does not need ICT skills to do the job. Similar to the findings of the OECD (2016), the figure highlights that ICT users are, all other things being equal, more likely to be employed as a whole in more skill-intensive jobs. A unique exception is the fact that that the jobs of advanced ICT users, in particular, are found to be less likely to rely on interpersonal (i.e. team-working and communication) and customer-service skills. Nonetheless, the jobs of ICT users are found to be unambiguously reliant on a higher level of cognitive skills (literacy, numeracy, problem-solving, learning to learn). Specifically, adults who are employed in jobs that require a foundation level of ICT skills simultaneously require a strong level of foundation skills (literacy, numeracy) as well as planning and organisation skills. By comparison, it is important to have strong numerical and technical skills if employed in jobs dependent on advanced ICT usage. Such jobs are significantly dependent on the ability of individuals to think of solution to problems (problem-solving skills) as well as to learn, adapt and apply new methods and technologies at work (learning skills). Furthermore, there is a positive association between ICT usage and the need for a foreign language to perform one’s job duties. Given the complementarity between digital and non-digital skills in the workplace, it is also possible to explore from the ESJ survey data the nature of the association between an individual’s digital skill gap and gaps in other relevant non-ICT skills. The analysis reveals that employees who are affected by ICT skill gaps have a higher propensity to experience simultaneous skill gaps in their foundation skills (literacy, numeracy) as well as their technical skills (i.e. specialist knowledge and technical equipment needed to perform job duties). There is also a significant positive association between the incidence of ICT skill gaps and the inability of adult workers to continue to learn in their jobs. The widespread transformation of the world of work is upon us and poses a significant challenge to policy-makers, who are called on to implement policies that will ensure that the immense benefits of the digital revolution are enjoyed by all individuals. Bridging the digital divide and making the leap across digital skill gaps requires a significant modernisation of Europe’s education and training systems as well as its job markets. This is evident by the fact that the usage of advanced ICT skills in EU workplaces, and the emergence of ICT skill gaps, is highly complementary with other technical and foundation skills and requires a high degree of learning aptitude on behalf of employees. Remaining competitive in the global market arena thus requires consistent investment in higher-order ICT skills and their integration within educational curricula as a key competence, since they are likely to become the norm in a wide(r) set of jobs in the future. Reinforcing the attractiveness of ICT-related subjects, and of STEM fields (science, technology, engineering, maths) in general, remains a critical issue of concern, given low levels of participation of young people in such subjects (European Commission, 2012). One way of accomplishing this is by exploiting the rising potential of new modes of online ICT education delivery, which can foster further private industry involvement in e-learning and the award of new high-quality e-certificates and qualifications. Building stronger partnerships between education and training providers and employers, such as the European Commission’s Digital skills and jobs coalition, is another. But the ESJ survey also highlights that a major part of the adjustment of humans to technological obsolescence will take place within workplaces, in the form of continuous and on-the-job learning. Ensuring the continuous adaptation of skills to new digital demands depends on the commitment of employers to human resource management practices that invest in people, not machines. It also needs significant reengineering of work methods and daily routines, especially in lower-skilled occupations and sectors. Only in this manner will the digital revolution translate into workplace evolution and continuous learning for the sizeable share of EU employees who, at the moment, do not require any ICT as part of their daily work. Finally, even though digitalisation has given rise to the new platform (or ‘gig’) economy, it will be critical for EU policy-makers and businesses to prevent rising marginalisation and job insecurity, ensuring that such new forms of work do not compromise the continuous skill development of individuals (Pouliakas, 2016). Cedefop (2015a), Skills, qualifications and jobs in the EU: the making of a perfect match?, Cedefop reference series No. 3072. Cedefop (2015b), Stronger VET for better lives: Cedefop’s monitoring report on vocational education and training policies 2010-14, Publications Office of the EU: Luxembourg, Cedefop Reference series No. 98. Cedefop (2016), ‘Rise of the machines: Technological skills obsolescence in the EU’, #ESJsurvey INSIGHTS No 8, Thessaloniki: Greece. European Commission (2012), ‘Exploiting the employment potential of ICTs’, Commission Staff working document SWD(2012) 96 final, Communication from the Commission to the European Parliament, the council, the European social and Economic Committee and the Committee of the Regions, ‘Towards a job-rich recovery’. OECD (2016), Skills for a digital world, OECD Digital Economy Papers, No. 250. Pouliakas, K. (2016), ‘Multiple job-holding: career pathway or dire straits?’, IZA World of Labor, forthcoming. Further information about the survey on Cedefop’s website. Discover more ESJ survey indicators and analysis on the Skills Panorama website. NB: The ‘adjusted skill gap (purged of skill intensity)’ is based as the lowest quartile of values of the estimated residuals, computed following an OLS regression of the raw digital skill mismatch scores of respondents on (i) an indicator of the importance of ICT skills and (ii) an summary index of the importance of 10 non-ICT skills for the job (e.g. literacy, numeracy, problem-solving etc.). The estimation is done on a subsample of adult employees whose jobs require a fundamental digital skill level. Please cite as: Cedefop (2016), ‘The great divide: Digitalisation and digital skill gaps in the EU workforce’, #ESJsurvey Insights, No 9, Thessaloniki: Greece. See Cedefop (2016), ‘Rise of the machines: Technological skills obsolescence in the EU’, #ESJsurvey INSIGHTS No 8, Thessaloniki: Greece. 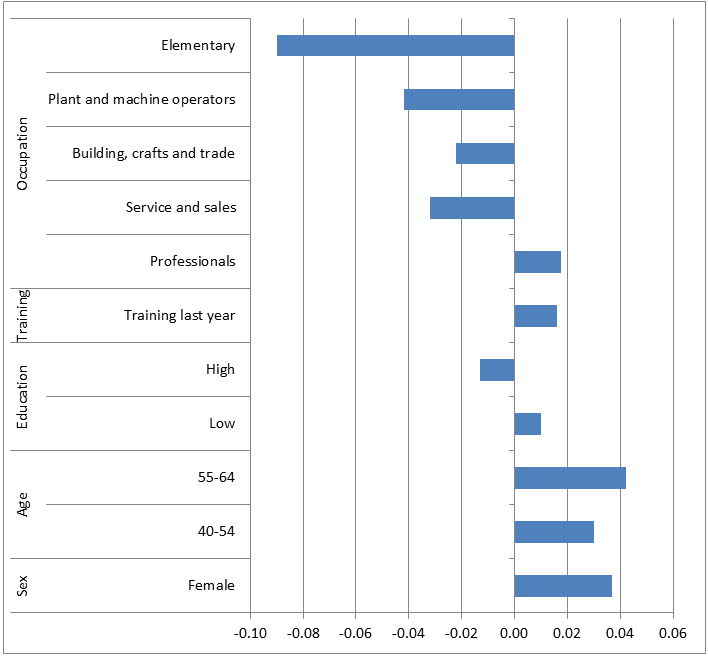 The analysis regarding the likely direction of future skill demands in Europe is derived by combining recent information on the underlying skill needs of EU sectors and occupations, as collected by Cedefop’s ESJ survey, with Cedefop’s forecasts of sectoral/occupational employment trends in EU labour markets. The ESJ survey mismatch questions were phrased on a 0-10 scale, where 0 means that the level of an employee’s (digital) skills is a lot lower than required to do the job, 5 matched to what is required and 10 a lot higher than required. Given that the distribution of the mismatch questions was skewed to the left, the analysis has classified workers as suffering from a skill gap if their response was below a value of six, which corresponds to the lowers quartile of the distribution of the mismatch scale. 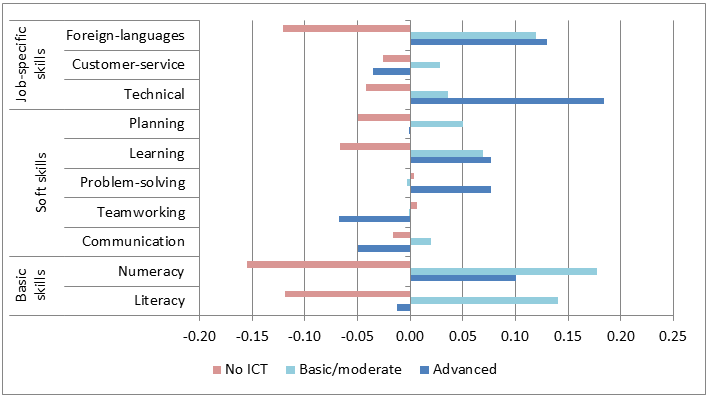 ‘Severe’ digital skill gaps, namely those corresponding to respondents who ranked their own skills at a value less than 5 in the mismatch scale, are much lower and amount to 5% for users of basic ICT skills, 2.7% for those needing moderate ICT skills and 3.7% for advanced ICT users. For instance, a job needing fundamental ICT skills in one country may entail higher-skilled tasks relative to what is also classified as a fundamental ICT skill job in another country. To purge out the effect of the skill intensity of employees’ jobs from their reported digital skill mismatch score, a multivariate OLS regression of the mismatch score has been first performed on a set of two explanatory variables (1) the stated importance of digital skills and (2) the stated importance of a set of 10 additional cognitive and soft skills (e.g. literacy, numeracy, foreign languages, technical, communication, planning, learning to learn, team working, customer service, problem-solving). The sample consists of those employees who identified in a previous question that their job requires a level of fundamental digital skills. Based on the estimated residuals, employees have been classified as having a fundamental digital skill gap if their residual scores correspond to the lowest quartile of the distribution of responses. Workers who declared that ICT skills are not important for their jobs (even if they previously acknowledged in the survey that their jobs require some level of ICT skills) have also been classified as non-ICT users. It is reasonable to deduce that the job tasks of such workers are likely to be mostly non-digitally-intensive. For instance, an ICT specialist in a software company may be employed in a job involving mostly administrative and/or managerial tasks. The definition of foreign language skills in the ESJS was ‘using a language other than your mother tongue to perform job duties’. It is, unfortunately, not possible to exclude the possibility that some ICT users may have classified some programming languages or computer syntax as a ‘foreign language’! All relevant estimated coefficients and regressions are available from the author upon request.